A natural fusion of old and new - Japan is truely timeless. Tea ceremonies, ancient temples and zen gardens blend seamlessly with glittering high rises and technology giants. Famous for its unique way of life, quirky fashion, pop culture and unparalleled food, makes Japan the perfect escape! Travel Dates: 01 Jul-15 Sep 19. Need more options? Call us for more travel deals to this destination. Please Note: Airfares & Transfers are additional. Surcharges apply for peak season & school accommodation. Travel Dates: 21 Mar-6 Apr 2020. Need more options? Call us for more travel deals to this destination. Travel Dates: 03-28 Mar 2020. Need more options? Call us for more travel deals to this destination. Departing: Selected travel dates between 22 Jun-13 Jul, 17 Aug, 02 Nov 19. Departing: Selected travel dates between 07 Jul, 17 Nov, 20 Dec 19. Departing: Selected travel dates between 28 Jul-06 Aug, 01-08 Oct 19. Departing: Selected travel dates between 21 Jul, 04 Aug, 10 Nov 19. Departing: Selected travel dates between 03, 10 Nov 19. Travel Dates: 05 Apr-31 Dec 19. Need more options? Call us for more travel deals to this destination. Travel Dates: 05 Apr-30 Dec 19. Need more options? Call us for more travel deals to this destination. Travel Dates: 05 Apr-31 May 19. Need more options? Call us for more travel deals to this destination. Travel Dates: 05 Apr-27 Dec 19. Need more options? Call us for more travel deals to this destination. *Prices are correct as at 26 March 2019, are subject to availability & are subject to change without notice. Sale period: Valid for sale until 9pm, 30 April 2019, unless sold out earlier or withdrawn. Selected travel dates apply. Please see individual listings for specific terms and conditions. 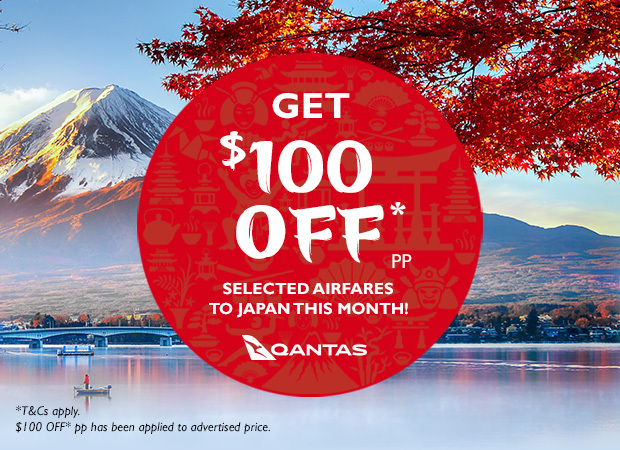 $100 OFF* Japan Airfares: Based on return economy flights to Japan flying Qantas Airways. $100 discount has already been applied to advertised price. Valid until April 30th April 2019. Airfares: Capacity may be limited and fare may not be available on all services or routing options. Selected blackout dates may apply depending on date of travel, contact your travel expert for more information. Additional surcharges may apply. Please see individual listings for specific terms and conditions. Accommodation: Airfares are additional. Tours & Rail Pass: Airfares, pre & post accommodation required are additional unless otherwise stated. Prices are correct at time of publication to the web, but are subject to change without notice, and can be withdrawn or varied without notice. Discounts apply to land portion of tour only (excludes food fund, taxes, flights & extra accommodation). Tours may not include all meals; please see tour listings for approximate additional meal costs. Optional excursions, non-included meals and personal spending money are not included. Cruise: Prices shown are per person, based on twin share unless otherwise stated and fully inclusive of taxes, levies, government charges & other applicable fees. Airfares, transfers and accommodation required pre/post cruise are additional unless otherwise stated. Gratuities may be additional and are payable on board. All bonuses and upgrades are subject to availability. Cruise Upgrades: Upgrades are subject to availability at time of booking. General conditions: All prices are per person and in NZ Dollars, unless otherwise stated. Prices are correct at time of publication to the web, but are subject to change, withdrawal or variation without notice. All prices are based on payment by cash or EFTPOS only. Airfares & holiday packages include airline, operational costs, prepayable taxes & airport charges unless otherwise stated. Additional levies, government charges & other applicable fees may apply & are beyond our control. Blackouts and seasonal surcharges depending on date of travel. Minimum & maximum stay restrictions may apply. Selected deals are based on restricted flight schedules, hotel check in/out time & are ultimately the responsibility of the passengers upon booking to ensure flight schedules & hotel check in/out time are suitable for their needs. Seasonal surcharges & blackout dates may apply depending on date of travel. Stopovers & alternative routes may incur additional costs. Any bonus inclusions, additional nights or special offers are already included in the advertised price. Travel insurance is recommended. Prices are valid for new bookings only. Any accommodation, holiday packages, cruises & tours are based on twin share unless otherwise stated. Holidays are based on consecutive night stays. Accommodation star rating is based on Flight Centre ratings & is a guide only to the overall quality of the property. The accommodation, cruises, airfares, coach & small group tours & any other components included in your holiday are provided by carriers & hoteliers with their own terms & conditions, which your booking is subject to. We reserve the right to correct any errors or omissions. For full terms & conditions visit www.flightcentre.co.nz/bookingterms.